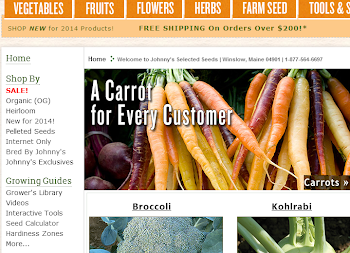 Johnny's has all the seed-starting supplies you need, and we have them available for immediate shipping. This month only, all seed-starting supplies are 10% off. Stock up for the rest of the season! Click here to learn more. Desperate for something green after a long, gloomy winter? Hungry for something fresh and home-grown? You don't have to wait for the outdoor gardening season; now is the perfect time to grow a crop of micro mix for sale or your own table. Micro mix, also called microgreens, is a mixture of tender gourmet vegetable seedlings cut at the first true leaf stage and blended together into a colorful confetti. Commercial growers produce micro mix in heated greenhouses, using a combination of varieties that they select to create a signature product. Johnny's has dozens of varieties that can be grown for micro mix; the key is to choose varieties that germinate at the same time, and to keep seed costs in line with the prices you can charge for the finished product. 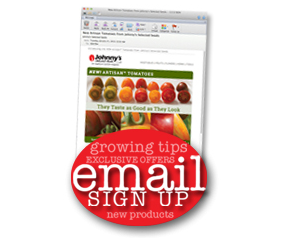 You'll find a chart listing both fast-growing and slow-growing varieties in the catalog or on the website. Additionally, you can download instructions for commercial micro mix production there. For personal use, growing micro mix is a fun and nutritious way to use up leftover seed or experiment with new flavors. The tiny plants are a vitamin-rich, flavorful addition to salads, sandwiches, and other dishes. You can grow a tray of mixed seedlings in a greenhouse, under grow lights, or even in a sunny window. Micro mix can consist of many kinds of vegetables, including amaranth, beets, broccoli, cabbage, pac choi, mizuna, arugula, mustards, kale, radishes, and any of the tender annual herbs such as basil, fennel, and cutting celery. To grow micro mix at home, start with a seedling flat, a salad clamshell box, or other shallow container with drainage holes, with a solid tray below it to catch water. Fill with an inch or two of pre-moistened potting mix. Spread seeds across the entire surface of the flat, as thickly and evenly as possible. You may mix varieties together or plant them in separate sections in the tray. Press the seeds gently into the soil, then sift a thin layer of soil on top to lightly cover the seeds. Mist with a spray bottle, cover with an acrylic dome, and put the tray on a heat mat or in a warm place. As soon as the seeds start to germinate, remove the cover and provide strong light to the seedlings. Keep the soil moist by spraying or bottom-watering. Within one to two weeks, your seedlings should have their first set of true leaves, which means they are ready to harvest. Cut them with sharp scissors and enjoy. When day length is less than 10 hours, as it is during the depths of winter in much of North America, most plants stop growing because of the lack of light. But in early to mid February, the days are long enough again for plant growth to resume. If you have a heated greenhouse or an unheated hoophouse, you can get an extra-early start to your season. Here are some ideas for plants to start now through April. In an unheated hoophouse, you can start direct seeding cold-tolerant plants including beets, carrots, cilantro, radish, salad mix (mesclun), scallions, spinach, and turnips. By Feb. 15, it is generally safe to plant these anywhere in the U.S. inside a hoophouse. In very cold areas, you may also need a low tunnel inside the house to provide extra protection. At the same time, you can start transplants in a greenhouse or under grow lights for planting into the hoophouse in two to three weeks. Plants that are better transplanted than direct seeded include chard, Chinese cabbage, head lettuce, onions, and radicchio. Be sure to transplant in a timely manner to avoid stunting or premature bolting. Succession planting is one of the more challenging aspects of commercial vegetable production because there are no prescriptions or shortcuts. You have to work out your successions to fit your own marketing schedule, climate, and crops. And then you have to refine your plans every year, as you learn how specific varieties perform for you. Good record keeping and analysis are essential to successful succession planting. Here are some general rules to keep in mind for scheduling your greenhouse transplants. Heat mat space and bench space are two limiting factors for transplant production, so try to plant only what you need. Check the germination rate on the seed packet to determine how many seeds will give you the required number of seedlings. Add 10-20% to account for possible losses. Avoid the temptation to plant far more than you need because, if all goes well, you will be faced with the even bigger temptation to grow more than you wanted just to keep from throwing out healthy seedlings. Plants grow more slowly in the shorter days and cooler temperatures of late winter, even in a heated greenhouse. It's possible that plants seeded a week or two later will catch up with an earlier planting. Keep careful records about seeding dates to determine if this is the case. Days to maturity printed in the catalog and on the seed packet can be used as a guideline for scheduling your successions. But it is highly accurate only when optimum temperatures are provided, so pay attention to recommended temperatures. Johnny's catalog includes detailed growing instructions for every crop. You should know the earliest dates you can plant groups of crops, based on the average last frost date for your area. Count back the average days to maturity of a variety to determine when to seed the first succession. You should also figure out the latest date you can expect to have crops, and count back the days to maturity to determine when to seed your final succession. For example, you may be able to plant cold-tolerant crops such as broccoli in early April, two weeks before final frost. If your summers are extremely hot, you might have to set a date in June as the time when broccoli starts to decline. Count backward from both dates to determine your earliest and latest possible seeding dates. Choose several varieties of each crop to provide a longer season. Start the season with a cold-tolerant variety, then switch to a heat-tolerant variety for summer harvests, then switch back to the cold-tolerant variety for fall. With all these variables in mind, create a calendar of seeding dates to keep in the greenhouse. Get yourself in the habit of starting seeds on a specific day of the week. You will have a much better likelihood of sticking to your schedule, and having multiple successions of transplants to keep your crops producing all season. Hi. This is the first of your blog posts that I've read. I like the ideas - both blogging, and getting an early start with the hoop houses. I'm going to think about the hoop-house thing for next year. For this year, I'm going to focus on getting some of my seeds started indoors again (tried it for the first time last year), and on trying out a couple of new crops in an attempt to settle on a fairly stable mix of things to grow each season. That mix is still evolving. This year I'm going to try several different salad greens. I've already ordered some potatoes. And I hope to finally get a rhubarb order in early enough, before you run out. I've been buying stuff from you folks off and on for years, and it's great doing business with you. Please say 'hey' to Johnny for me - we met back in 1991 when he came down to Carlisle, MA for the first ever "Pig and Pepper Barbecue Harvest." In fact, Johnny's Seeds was the first corporate sponsor. Last year we had a problem with your organic Delicata seeds... which turned out to not be delicata. What is the risk this year? I'd love to start a hoophouse but can't manage the hoops so I thought I'd make a tenthouse. I plan to tie the tops and the ridge together to hold it steady and bury about a foot of lumber in the ground at each corner. I will be able to lift the sides when I need to check my plants or weed or whatever, I hope. I'm off to buy some 2 b 2s to begin. I'll let you know how it works out. I'll also be placing my order for row cover and some seeds later today along with soil block trays. I bought your 2 smaller soil block makers last year and its a great idea. I have lots of the starter mix left for this year. I had early problems last spring in starting seedlings indoors. I keep my house very cool, around 58* and didn't have a heat mat. The first efforts failed since my only windows (daylight basement apt) face west. Got a heat mat and tried starting a few more plants. I got some eggplant, Ace peppers and a couple of tomatoes started with its help. I'm learning about gardening all the time so this 2nd year of gardening I hope to do lots better. Thanks for the helpful newsletter. I'd like everyone to know that, this year, our town is starting its first Community Garden (organic) and we will be ordering seeds from Johnny's. Being a Maine town, we think its best to stay with a company that carries many cold-tolerant varieties. We members will have our own individual plots but we will also reserve several rows to provide many fresh vegetables for our local Food Pantry each year. I have grown lettuces, turnips, radishes, Chinese cabbage and Bok Choi in the hoop house early with low covers. Hadn't thought of trying carrots and beets. Growing turnips early helps to get some before the worms find them. I have a question about seed starting... I do not have any problems with getting the seeds started. My problem is most of my seedlings get leggy. I do not have a greenhouse and have very poor places to start my seeds. I live in Florida on the border of zones 8 and 9. What type of plants can I plant outside that will do well right now? My last frost date is February 20. And, what do I do with the leggy starts? Quiltbea (and others): Send us some photos of your set-up. We'd love to see how that project turns out. You can submit photos via our Flickr photo sharing web site. Merry: There's a good selection of varieties to start now in the south on the Johnny's web site, These are more for the hoophouse, but some of them may work. We'll do a little research and try to narrow down a list for you.